Figures released by the British Retail Consortium (BRC) has shown footfall has increased in March, at 1.4%, compared to the previous year when it fell by 6.0%. On a three-month basis, footfall dropped by 0.3%. The six and twelve–month averages are both at -1.4%. 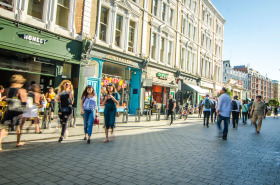 However high street footfall increased by 2.5%, against a decline of 8.6% in March 2018, which was above the three-month average growth of 0.2%. Retail Park footfall also increased, this time by 1.5%, in contrast to March 2018 when footfall decreased by 1.8%. Shopping Centre footfall, on the other hand, fell by 1.0%, against a decline of 4.8% in March 2018, now the 24th month of consecutive decline. This was above the three-month average of -1.7%. “The data also showed that shopping centres continue to suffer, with 24 consecutive months of decline in footfall. It is vital that all different shopping locations are fit for the future, offering the mix of retail and experience-led opportunities that generate the necessary footfall to succeed. Furthermore, Government can support this transformation by reforming the outdated business system which holds back firms from investing in physical space." Springboard marketing and insights director, Diane Wehrle commented: “At first sight the year on year rise in footfall of +1.4% in March appears to signify a reverse in trend from the previous two years, when footfall dropped in all but two of the past 22 months. However, whilst news of an improvement in footfall would be most welcome, it is simply not the case and instead the rise of +1.4% should be regarded as an exceptional circumstance relating to a dramatic slump in footfall in March 2018 of -6%. Indeed, this was by far the worst monthly result of the year and adversely influenced the outcome for footfall in 2018 as a whole.